This afternoon I realized that I was very hungry. With the heat and humidity over the past several days, I have not had much of an appetite so I have not been eating as much as I normally do. I think it finally caught up with me and instead of snacking on veggies and dip or other small meals I had been eating, tonight I needed a filling dinner. No one was home but me. So I spoiled myself rotten. I baked some stuffed pork chops--this used to be one of my favorite dinners growing up. It's my mom's recipe and it is delicious and EASY to prepare. Everyone thinks I go to great lengths whenever I make this, but it is a quick stir and throw it in the oven kind of dish! I also baked sweet potatoes (added a sprinkle of cinnamon) and cooked some fresh green beans. Tear the slices of bread into small, bite-sized pieces and place in a small mixing bowl. Add the applesauce and stir. Divide evenly and place on the pork chops covering them entirely. Bake at 350 degrees for about 35-40 minutes or until done. It doesn't get much easier than that! I have added craisins, chopped apple, walnuts, onions and celery--whatever floats my boat at the particular time....the pork chops are so nice and moist when they come out of the oven. The stuffing is delicious! I had a nice quiet dinner alone, out on the porch as thunderstorms were rolling in. I find the sound of distant thunder peaceful and relaxing. I dined in peace and quiet, with my dog Ellie at my side. "All four elements were happening in equal measure--the cuisine, the wine, the service and the overall ambience. It taught me that dining could happen at a spiritual level." This began as one of those serendipitous moments. I was out on my back porch folding a load of freshly washed linens (which I love to do btw) and I happened to glance over at a shelf holding my fabric stash. That's when it happened! Are you now thinking what I was thinking? I liken my experience to the old commercial for the Reese's Peanut Butter Cup (and I am probably dating myself here) where the lady holding a chocolate bar stumbles into the gentleman holding a jar of peanut butter. Then the couple exchanges accusatory words: "You got chocolate in my peanut butter". "Well, you got peanut butter on my chocolate bar." Then they lock eyes, they have this magical second or two before the light bulbs go on and the Reese's Peanut Butter Cup is born. I saw stars and I saw stripes and I had that same "aha" moment, though not nearly as corny! So I pulled out the fabric and whipped up a quick 4th of July project that anyone can do. I did this without a pattern, eyeballed the entire thing and ended up with a pillow approximately 14" x 10". If that size is fine with you, then your first step will be to cut (2) pieces of fabric and add 1/4" to 1/2" for seam allowance. For kids, it is sometimes easier for them to sew a wider seam allowance. Even easier, cut the fabric in a strip 28 1/2" wide (I did this) and that leaves only 3 sides to be stitched. Then cut a piece from the blue fabric. Again I eyeballed it and cut a piece about 6 3/4". I turned in the edges (to the wrong side--see above) on the right hand and bottom sides of the blue fabric as the piece will be stitched to the red fabric. The left side and top side of the blue fabric will be stitched into the seam allowance of the pillow. next...the bottom. Be sure to stitch very close to the edge. You can pin sides together before sewing. I stitched around the 3 sides and left about a 3" opening so I could stuff it. Pin the opening and whipstitch it closed. Your star spangled banner is now complete. ....an easy start to your 4th of July decorating. Great rainy day project for the kids. It is just pouring here! I have plenty of red ticking fabric left (I got this good sized remnant on clearance at Joanne's) so I have some other 4th of July ideas I hope to create and post, time permitting! Please scroll down to view update to this post: a larger pillow top that coordinates with the pillow above! 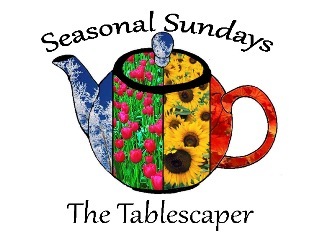 "You're a grand old flag....."
The Tablescaper's Seasonal Sunday Party CLICK HERE for some more 4th of July inspiration! More link-ups after the update below! I have been working on another pillow top to coordinate with the American Flag pillow I made this morning. This one is pieced and much larger. 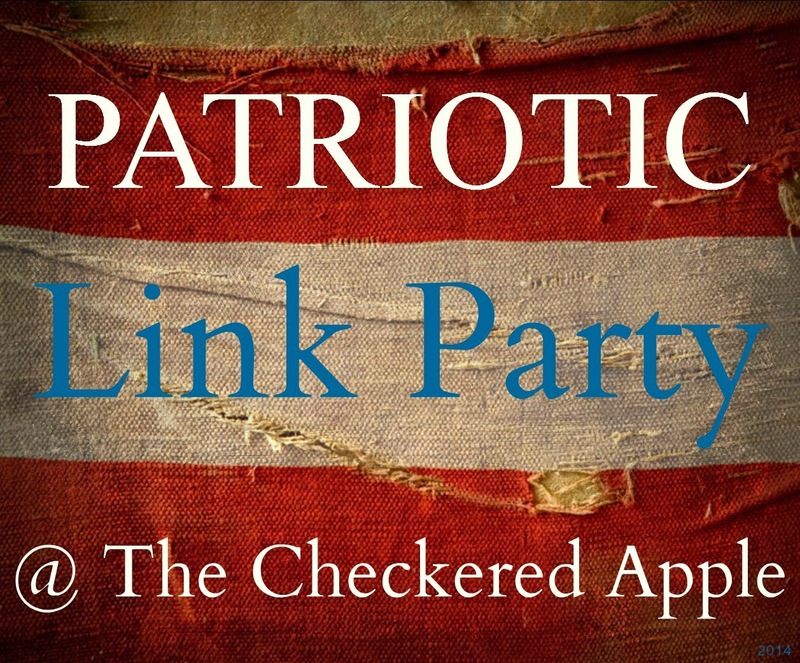 2014 Link ups: The Checkered Apple's Patriotic Link Party. Click HERE to visit or to link up your patriotic creations!